In our final issue for 2014, the HD Insights team wanted to recognize the most influential papers in HD research in the 2013–2014 year. Our staff, Editorial Board, and leading HD researchers nominated the eleven papers below in three categories: lab research, clinical research, and imaging and biomarkers. The HD Insights Editorial Board then voted to select the three most influential papers, one in each category. The authors of the winning papers will present their research in a panel discussion at the Huntington Study Group meeting on November 7, 2014. Congratulations to all the nominees and winners! Ann Neurol. 2014 Jul; 76(1):31-42. doi: 10.1002/ana.24174. Epub 2014 Jun 6. Mutant huntingtin (mHTT), which drives HD pathology, has long been thought to exert its effects in a cell-autonomous manner, where degeneration occurs within individual cells that carry the mutant gene. We investigated the hypothesis that mHTT is capable of spreading within cerebral tissue. The brains of four HD patients who received genetically unrelated fetal neural allografts at least a decade earlier were examined postmortem. We found a number of mHTT protein aggregates located within intracerebral allografts of striatal tissue in three of these HD patients. No grafts survived in the fourth transplant recipient. The mHTT aggregates were observed in the extracellular matrix of the genetically unrelated transplanted tissue, while in the host brain they were localized in neurons, neuropil, extracellular matrix, and blood vessels. In addition, peripheral immune cells in separate HD patients contained mHTT. There are thus a number of non-cell autonomous mechanisms that could explain these observations, including trans-synaptic propagation and hematogenous transport of mHTT, among others. This is the first in vivo demonstration of mHTT spread in patients with a monogenic neurodegenerative disorder of the CNS. These observations raise questions about the importance of non–cell-autonomous mechanisms of pathological protein spread, and provide new targets for the development of therapeutic strategies. J Neurosurg. 2014 Jul; 121(1):114-22. doi: 10.3171/2014.2.JNS131722. Epub 2014 Apr 4. 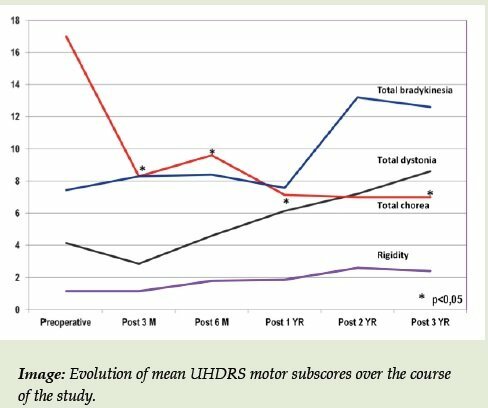 The role of deep brain stimulation (DBS) in the clinical management of HD has not yet been validated, although promising case reports have shown its efficacy in the treatment of severe chorea. This study aimed to analyze long-term motor outcome of a cohort of HD patients treated with globus pallidus internus (GPi) DBS. Seven patients with pharmacologically resistant chorea were included in a prospective open-label study with a median follow-up of three years. The Unified HD Rating Scale motor section was the main outcome measure. GPi DBS led to significant reduction of chorea for all patients with a mean improvement of 58.3% at one-year visit and 59.8% at three-year visit (p<0.05). Switching OFF stimulation tests confirmed sustained therapeutic effect for chorea throughout the study period. Bradykinesia and dystonia showed a non-significant trend towards progressive worsening. Increased bradykinesia was partly induced by DBS settings, and improved after adjustment of stimulation parameters. GPi DBS may provide sustained reduction of chorea in selected HD patients, with transient benefit in physical aspects of quality of life before progression of behavioral and cognitive disorders. Further studies are needed to assess the impact of GPi DBS on quality of life and cognitive measures in HD. Neurology 2014 Mar 11; 82(10):850-7. doi: 10.1212/WNL.0000000000000187. Epub 2014 Feb 7. PRECREST, the first clinical trial of a drug intended to delay the onset of symptoms in individuals at risk for HD, enrolled sixty-four participants, of whom nineteen knew their gene status. Participants were randomized into two groups, regardless of gene status: one group to twice-daily oral doses of creatine, up to thirty grams per day, the other, placebo for six months. Participants were followed for an additional twelve months on open-label creatine and assessed at regular study visits for adverse effects, and dosage levels were adjusted, if necessary, to reduce unpleasant side effects. Cognitive assessments, measurement of blood markers and MRI brain scans were conducted at the trial’s outset, at six months, and at the end of the study. Fifteen participants, including several who knew that they carried the HD mutant gene, discontinued taking creatine because of gastrointestinal discomfort, taste of the drug, inconvenience, or the stress of being constantly reminded of their HD risk. MRI scans at six months showed a slower rate of cortical and basal ganglia atrophy in gene-positive carriers who took creatine, compared to placebo. After twelve months, atrophy rates in those who crossed over to treatment were also slower than during the period of taking placebo. The results of the trial suggest that at-risk individuals can participate in clinical trials even if they do not want to learn their genetic status, and that useful biomarkers can be developed to help assess therapeutic benefits. Julie Smith came to Raptor Pharmaceuticals in 2012 and currently serves as the company’s President and CEO (designate). Ms. Smith aims to utilize her experience in drug development and commercialization for orphan diseases to bring promising drug therapies to patients with rare diseases around the world. Prior to her current position at Raptor Pharmaceuticals, Ms. Smith served as Chief Commercial Officer of Enobia Pharma, Inc., Vice President of Commercial at Jazz Pharmaceuticals, and led the global marketing efforts for enzyme replacement treatments at Genzyme General. HD Insights recently interviewed Ms. Smith about Raptor Pharmaceuticals’ work with cysteamine bitartrate for HD. Below is an edited transcript of the conversation. SMITH: I first heard about HD from Abbey Meyers, who was one of the founders of the National Association of Rare Disorders (NORD). NORD was founded with the assistance of Woody Guthrie’s widow, so HD was one of the first rare diseases put forward. Patient advocates came to the forefront and really pushed for policy changes and improvements that would help communities affected by rare diseases. When you hear the story of someone affected by HD, it leaves an indelible imprint on you. HD INSIGHTS: Can you tell us about the mechanism of action of cysteamine in HD? 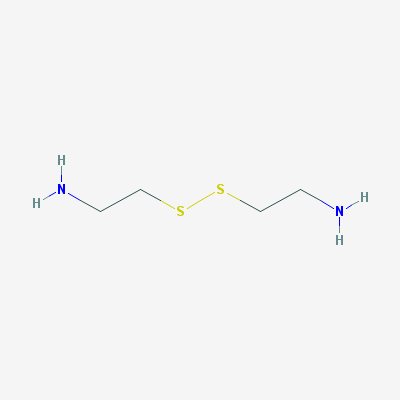 SMITH: Cysteamine, a prodrug of cystamine, mobilizes cysteine as it is metabolized. This is believed to have several therapeutic benefits. Firstly, the systemic increase in cysteine has been shown to have both a direct and indirect anti-oxidative effect to cells, while cysteine is rate-liming in the biosynthesis of glutathione, a potent anti-oxidant that has shown protective effects in patients with HD. Secondly, a recent paper published by Solomon Snyder at Johns Hopkins showed that individuals with HD have a major deficit of cystathionine gamma-lyase, which is essential for biosynthesis of cysteine, suggesting another reason that boosting systemic cysteine may be important in HD therapy.1 Thirdly, cysteamine has been shown to up-regulate a number of the cell’s own adaptive stress responses. Mutant huntingtin (mHTT) causes cell stress because the cell must deal with the mutant protein, which it does by forming aggregates. Aggregates of mHTT may trap other normally functioning proteins, and mHTT fragments are difficult for cells to process. Cysteamine up-regulates several heat shock proteins, which may help to normalize protein folding. Mis-folding is indeed a characteristic of mHTT. Finally, it has been observed that cysteamine increases the production and intracellular transport of brain-derived neurotrophic factor, which has also been shown to be deficient in the brains of individuals with HD and other neurodegenerative diseases. HD INSIGHTS: Please describe the design of your clinical trial. SMITH: The study was first conceived of and designed in 2010. The French members of the Huntington team had designed a proof-of-concept study, and the more they came to understand the biology of cysteamine, the more excited they became about its potential application in HD. They approached Raptor as we were forming a company, and requested access to RP103, to conduct a prospective placebo-controlled, 36-month trial in early-stage HD patients. The trial consisted of two separate segments: an 18- month placebo-controlled segment, followed immediately by an 18-month open-label, treatment segment with RP103. The primary objective of the trial was to measure the efficacy, safety, and tolerability of RP103 in the treatment of total motor deterioration, compared to placebo, at 18 months, which was the primary endpoint. Secondary endpoints include all components of the UHDRS scale, as well as imaging, quantitative motor assessments, and some additional neuropsychiatric testing. HD INSIGHTS: Can you tell us briefly about the results? SMITH: In the data that have been released, total motor score deterioration was approximately 34 percent slower in the RP103- treated patients compared to placebo at 18 months in the 89 patients who completed that phase of the trial. This was not statistically significant. When we received those results we naturally wanted to understand more about individual measures and results in the trial to decide if it was worthwhile to continue. We looked at the other medications that study patients were taking, because some medications, particularly the neuroleptics like tetrabenazine are known to have an effect on patient voluntary movement ability. Total motor score is a collection of 15 different individual tests that measure involuntary and voluntary movements, and involuntary chorea is one component of the total motor score, which comprises approximately ten percent of the overall score. Approximately 33 percent of the study patients were found to be taking tetrabenazine to control their chorea. We looked at the treatment groups of the patients not taking tetrabenazine and other neuroleptics and antipsychotics just to see if those other treatments could have had the effect that we saw – a positive trend – or whether it was directly attributable to RP103. In the 66 patients who did not take tetrabenazine and who were treated with RP103 or placebo, we saw a 57 percent slower progression of total motor score deterioration compared to placebo. This was statistically significant (p=0.03) and clinically significant, and encouraged us to look at the individual measurements and different components of total motor score. The French investigators are working very hard to get all the data assembled and published. In terms of safety, I should also note that there were no unexpected adverse events with RP103. HD INSIGHTS: What are your plans for cysteamine? SMITH: We are very positive about cysteamine’s potential in HD. The trial is ongoing, and we look forward to the 36 month results. As the second 18 months is open label with all patients taking RP103, we will not necessarily be able to compare the two arms of placebo treatment and continuous treatment with RP103 in terms of the total motor score, but there are other measurements such as imaging that may provide more insight into cysteamine’s effectiveness over the full course of 36 months. A 36-month trial is pretty challenging to pull off, but patient retention has been strong. All patients who have finished have insisted on staying on open-label extension treatment. We have been able to grant patients access to RP103 for that purpose and we’ll continue to do so until all patients complete their last treatment. We are in the process of speaking with regulators in the USA and Europe in an effort to clarify the path to approval of RP103 for use in HD. HD INSIGHTS: Thank you very much for your time and for your interest in HD therapeutics. SMITH: Thank you. It’s our pleasure and our purpose. 1 Paul BD, Sbodio JI, Xu R, Vandiver MS, Cha JY, Snowman AM, Snyder SH. Cystathionine γ-lyase deficiency mediates neurodegeneration in Huntington’s disease. Nature. 2014 May 1; 509(7498):96-100. doi: 10.1038/nature13136. Epub 2014 Mar 26. Dr. Ira Shoulson has been a driving force in HD research and discovery since the late 1970s. He founded the Parkinson Study Group (PSG) in 1985 and the Huntington Study Group (HSG) in 1994, both groundbreaking research networks for clinical trials in Parkinson disease and HD. 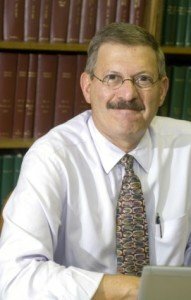 He was the Louis C. Lasagna Professor of Experimental Therapeutics, and Professor of Neurology, Pharmacology and Medicine at the University of Rochester School of Medicine in Rochester, New York from 1990 to 2011, and Chair of the HSG from 1996-2014. Dr. Shoulson recently shared his journey and his hopes for the future of HD research with HD Insights. Beginning on page 2 is an edited transcript of the conversation. HD INSIGHTS: How did you first become interested in HD? SHOULSON: In 1973, I finished my residency in internal medicine and went to the NIH for a clinical research fellowship. I was part of the Public Health Service, and one of my jobs was working under Dr. Tom Chase, who ran the Experimental Therapeutics branch of the National Institute of Mental Health (NIMH), a research program involving patients with PD and HD. I had seen PD during my residency training, but I had never seen HD. In about two months I saw fifty to sixty HD patients and their families volunteering to participate in research. Shortly after, Dr. Chase was promoted to scientific director of the NIH Neurological Institute, and I, so to speak, inherited this wondrous research world for the next two years. I then returned to the University of Rochester for a formal neurology residency. By the time I joined the faculty in 1978, I had seen and cared for about 200 patients with PD and HD. So like most interesting things in life, these opportunities were just very serendipitous and fortuitous. HD INSIGHTS: You eventually became involved in the Venezuela project, correct? SHOULSON: Yes, from 1975 to 1977, I was involved in research at the NIH and met two really important people. One was Marjorie Guthrie, who was trying to get the word out about HD. I was in Washington, DC and watched her convince Congress and key thinkers in government of the importance of supporting HD research. She actually started a commission that I was part of, and that set the stage for the creation of the Total Functional Capacity scale that Dr. Stan Fahn and I developed between 1977 and 1980. While at the NIH, I also met Dr. Nancy Wexler, another important influence. Nancy had this crazy idea that perhaps we could use the “new genetics”—which at the time meant restriction fragment length polymorphisms (RFLPs)—to identify the HD gene in a large unexamined population of individuals with HD living along Venezuela’s Lake Maracaibo. In 1980, Nancy and Tom went to Venezuela, and when they returned he said, “This looks like HD we see in the USA.” Nancy recruited Dr. Anne Young, Dr. Jack Penney and me to the project. We were all junior faculty, Anne and Jack at the University of Michigan and I at the University of Rochester. I spent the next fourteen years traveling in February or March to Maracaibo, which was our headquarters for field research work. I sought to identify and characterize clinical phenotype and obtain biological samples, primarily blood, for DNA. HD INSIGHTS: What did it feel like when you heard from Drs. Jim Gusella, Marcy MacDonald and colleagues that they had identified a genetic marker? SHOULSON: We were surprised, because we had started in 1980, and by 1983 the linkage for the HD gene had been established and localized to the short arm of chromosome 4. Of course, establishing genetic linkage was different from identifying the gene itself. We were surprised at how quickly the linkage came, but also surprised at how long it took—ten more years—to identify and characterize the HD gene mutation. HD INSIGHTS: After identifying the gene, you started thinking about forming the HSG, correct? HD INSIGHTS: What was the biggest challenge in forming the HSG? SHOULSON: Well, I think the biggest challenge, besides the buy-in (“Are we going to do this?”), was actually doing something substantive. The old saying is, “The proof of the pudding is in the eating,” meaning that talking about things and doing them are often quite different. We talked about a unified clinical research scale, but realized we didn’t have anything like it and needed to develop such a tool. I remember that at a meeting in Boston in 1994, I got four groups together and locked each group in a room—figuratively speaking, of course—and said, “You have to come up with a scale for measuring the motor, cognitive, behavioral, and functional domains of HD.” That was really the beginning. There were many contributions and refinements thereafter to what became known as the UHDRS. After several pilot studies, we started in 2003 to apply the UHDRS in HSG clinical trials. So that was an important ten years between the talking and the doing. HD INSIGHTS: What was the biggest success you experienced during your time leading the HSG? SHOULSON: I think the biggest success or satisfaction from my point of view is how sustainable the HSG has been. Like the PSG, once people were involved, such as investigators, coordinators, social workers, neuropsychologists, and scientists, the HSG built commitment, cooperation, momentum and sustainability. Our other early accomplishments were PHAROS, the observational study that was started in 1999, then the landmark “Neurobiological Predictors of Huntington’s Disease” (PREDICT-HD) (see HD Insights, Vol. 7, p. 8) and “Cooperative Huntington’s Observational Research Trial” (COHORT) studies,3 followed in short order by the CARE-HD trial of Coenzyme Q10 in HD.4 Our most tangible accomplishment was planning, conducting and reporting the TETRA-HD HSG trial that led to the approval of tetrabenazine to treat chorea associated with HD.5 Another benefit of approval of tetrabenazine was that it signaled to innovators in industry that HD should not be neglected, but rather be thought of as an important unmet need and a market. HD INSIGHTS: What was your biggest disappointment or failure? SHOULSON: Well, we never had a strategic plan, which in retrospect, I think would have been useful. In some fashion, we were just kind of flying by the seat of our pants. Eventually, in 2012, we made the transition to an independent entity, HSG, Ltd. That was an important milestone, moving from childhood into adolescence. I just wish we had gotten through that childhood a little bit faster. HD INSIGHTS: You recently accepted a position on the board of directors of Prana Biotechnology. Can you tell us why? SHOULSON: Prana Biotechnology was developing the experimental drug PBT2, which had novel mechanisms and showed safety and signals of cognitive benefit in a European Alzheimer disease trial.6 Working closely with Dr. Steven Hersch, we developed the clinical research interest in examining PBT2 in HD, and an approach that became the HSG Reach2HD dose- ranging phase II trial under the leadership of Dr. Ray Dorsey, Dr. Julie Stout, Dr. Diana Rosas, and Elise Kayson. As recently reported, Reach2HD showed safety and tolerability and signals of cognitive benefit that may prove to be reproducible and clinically meaningful (see HD Insights, Vol. 7, p. 1). Once my leadership of the HSG concluded in April 2014, and upon an invitation from Prana, I accepted the position as a non-executive director in order to provide clinical research expertise and help ensure that PBT2 was developed to its full potential in HD. Prana has a dedicated group of scientists and developers who have come to appreciate the many unmet needs of HD and the opportunities that exist to relieve some of the burdens. I continue my full-time work in leading the regulatory science program at Georgetown University, which has reviewed and authorized my work with Prana. I am compensated by Prana, both as a member of the board and as a consultant, but I have no equity positions, stock options, or incentive packages. I am focused on fully developing PBT2 for HD, whatever the outcome of future studies might be. HD INSIGHTS: What have you learned working directly for industry that you did not know before? SHOULSON: I learned a bit about business development as a bystander over the years that I was leading the HSG and taking on industry-sponsored research. I now better appreciate the need to integrate clinical research and business development. These endeavors are often undertaken in parallel but separately. That may be a mistake. It is very natural to do them together. The people responsible for business development must appreciate the clinical entity and unmet needs that are the problems that bother our patients and families. Then too, the clinical researchers who know and care for the manifold problems need to know how to be entrepreneurial and capitalize on opportunities. While seemingly awkward, clinical and business development best proceed hand in hand. HD INSIGHTS: What does the future hold for you? SHOULSON: I enjoy what I’m doing now. My day job is at Georgetown University, where I direct the program in regulatory science of medicine. It is an outstanding opportunity. We have a Center of Excellence in Regulatory Science and Innovation (CERSI) that is supported by the FDA, conducts important research in regulatory science, and offers an online Master’s program in regulatory science, linked to the Georgetown-Howard Universities Clinical and Translational Science Award (CTSA). Solid experimental evidence is key in making up one’s mind, whether making decisions as a regulator at the FDA, as a clinician or prescriber, or as a patient, family, or consumer. I find the commonality in decision-making about the safety and benefits of medical products to be very relevant and interesting. I have also become more interested in direct-to-consumer genetic testing, which the FDA regulates as a device. There are important issues about comprehension, literacy and numeracy of direct-to-consumer genetic tests as well as their accuracy, applicability and predictability. Regulatory science can provide a knowledge base to address these issues. Of course, genetic testing, choices and decision-making have been a centerpiece of HD interest for the past two decades. We have learned a lot about genetic testing that is guided by experience, data, laboratory quality, and knowledgeable clinicians, but this is not direct-to-consumer. HD INSIGHTS: Where do you see direct-to-consumer genetic testing going in the future? SHOULSON: I think it’s to be determined. You have to consider questions surrounding whether genetic testing should be treated as a medical device, because you usually use some kind of kit to do the testing. You have to ask, “Do we know enough about the scientific precision, predictability, and accuracy of the results? Do we know enough about the attitudes, beliefs, comprehension, expectations and resulting behaviors of the consumer as well as the clinicians to whom the consumers turn?” In other words, is direct-to-consumer genetic testing “good to go” as an over-the-counter medical product? I feel that we are not quite there yet, and there is a lot to learn. Consumers expect that their clinician will be able to guide them about the results of genetic testing, but that may not be in keeping with the knowledge and competencies of the clinician. It will take time to sort this out. HD INSIGHTS: You have devoted forty years of your professional life to advancing knowledge and therapeutics for HD. What would you like to see happen in the future? SHOULSON: It has been that long? In terms of HD, I think we need some substantive treatments, although I’m of the mind that substantive treatments come about incrementally and gradually. When you look back in ten or twenty years, it looks like a quantum leap. That certainly was true in developing HIV therapies. In HD, we have had the benefit of quickly improving understanding of the etiology, pathogenesis, and scientific foundations around HD. I expect incremental gains will be realized for our patients and their families. HD INSIGHTS: When you are not working on therapeutic developments for HD, how do you spend your free time? SHOULSON: I do a lot of traveling. Most is work-related, but I also do a lot with my wife Josie and family. We have a getaway place in Florida that’s right on the beach. I enjoy exercising, walking, and taking in the outdoors. HD INSIGHTS: I hear you have a very young companion in some of your exercises. SHOULSON: Oh, you mean my grandson Noah? Yes, he’s a joy. It’s really nice to experience this again. As a parent, it’s so interesting to watch your kids grow up. But when you get a chance to do it again with grandchildren, it’s fabulous, interesting and gratifying. A great environment for my encore career! HD INSIGHTS: Thank you very much for all of your contributions to the HSG and to the HD field. The field certainly wouldn’t be where it is without you and your leadership over the past four decades. 1 Kieburtz K, McDermott M, Como P, et al. The effect of deprenyl and tocopherol on cognitive performance in early untreated Parkinson’s disease. Parkinson Study Group. Neurology. 2 The Huntington Study Group PHAROS Investigators. At risk for Huntington disease: The PHAROS (Prospective Huntington At Risk Observational Study) cohort enrolled. Arch. Neurol. 2006;63(7):991-996. 3 Cooperative Huntington’s Observational Research Trial: NCT00313495. [Webpage]. 2014; clinicaltrials.gov/show/ NCT00313495. Accessed 10/7/2014. 4 Biglan KM, Dorsey ER, Evans RV, et al. Plasma 8-hydroxy-2′- deoxyguanosine Levels in Huntington Disease and Healthy Controls Treated with Coenzyme Q10. JHD. 2012;1(1):65-69. 5 Dorsey R, Biglan K, Eberly S, et al. Use of Tetrabenazine in Huntington Disease Patients on Antidepressants or with Advanced Disease: Results from the TETRA-HD Study. PLoS currents. 2011;3:Rrn1283. 6 Lannfelt L, Blennow K, Zetterberg H, et al. Safety, efficacy, and biomarker findings of PBT2 in targeting Abeta as a modifying therapy for Alzheimer’s disease: a phase IIa, double-blind, randomised, placebo-controlled trial. Lancet neurol. 2008; 7(9): 779-786. Raptor Pharmaceuticals’ delayed-release formulation of cysteamine bitartrate is currently approved for use in nephropathic cystinosis. An ongoing phase II/III clinical trial has thus far shown RP103 to be safe and well-tolerated in HD patients compared to placebo, and has demonstrated a small but significant slowing of progression of total motor score over 18 months in patients not taking tetrabenazine. In patients already taking tetrabenazine, the slowing of progression of total motor score announced in February 2014 was not statistically significant.6 The trial is ongoing in France and is scheduled to conclude in 2015. 1 Bacq ZM, Beaumariage ML, Van Caneghem P. Importance for radioprotective effect in mammals of pharmacological and biochemical actions of cysteamine and related substances. Annali dell’Istituto superiore di sanita. 1965; 1(9):639-645. 2 Gibrat C, Cicchetti F. Potential of cystamine and cysteamine in the treatment of neurodegenerative diseases. Prog Neuropsychopharmacol Biol Psychiatry. 2011 Mar 30; 35(2): 380-389. 3 Paul BD, Sbodio JI, Xu R, Vandiver MS, et al. Cystathionine gamma-lyase deficiency mediates neurodegeneration in Huntington’s disease. Nature. 2014 May 1; 509(7498):96-100. doi: 10.1038/nature13136. Epub 2014 Mar 26. 4 Beal MF. Bioenergetic approaches for neuroprotection in Parkinson’s disease. Ann Neurol. 2003;53 Suppl 3:S39-47; discussion S47-38. 5 Borrell-Pagès M, Canals JM, Cordelières FP, Parker JA, et al. Cystamine and cysteamine increase brain levels of BDNF in Huntington disease via HSJ1b and transglutaminase. J Clin Invest. 2006 May; 116(5):1410-24. Epub 2006 Apr 6. 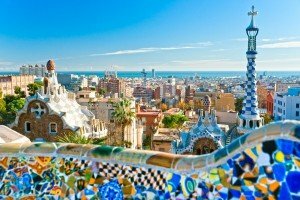 6 Raptor Pharmaceuticals: Raptor announces clinical results with RP103 in Huntington’s disease phase 2/3 trial. 18 month clinical results showed significantly slower progression of total motor score in RP103 treated patients without tetrabenazine [Internet media release]. 2014 [cited 2014 Apr 9]. Available from: http:// ir.raptorpharma.com/releasedetail.cfm?ReleaseID=826962. Welcome to the 9th edition of HD Insights. We are grateful to the Huntington Study Group (HSG), our sponsors, and our over 2,500 subscribers for their continuing support of our mission. In this special edition, we feature Dr. Ira Shoulson, founder and leader of the HSG from 1996 to 2014. Dr. Shoulson’s leadership and vision have been powerful forces for HD research for forty years. HD Insights also brings you the nominees and winners of the first Insights of the Year competition. The HD Insights staff and expert HD researchers nominated eleven papers published between July 2013 and July 2014 in HD basic science, clinical research, and biomarkers research, for consideration by our Editorial Board. The Board voted on the papers to select the most influential paper in each category. As a result, Drs. Francesca Cicchetti, Chris S. Tang, and X. William Yang will be presenting their winning research in a special panel session at the HSG meeting. 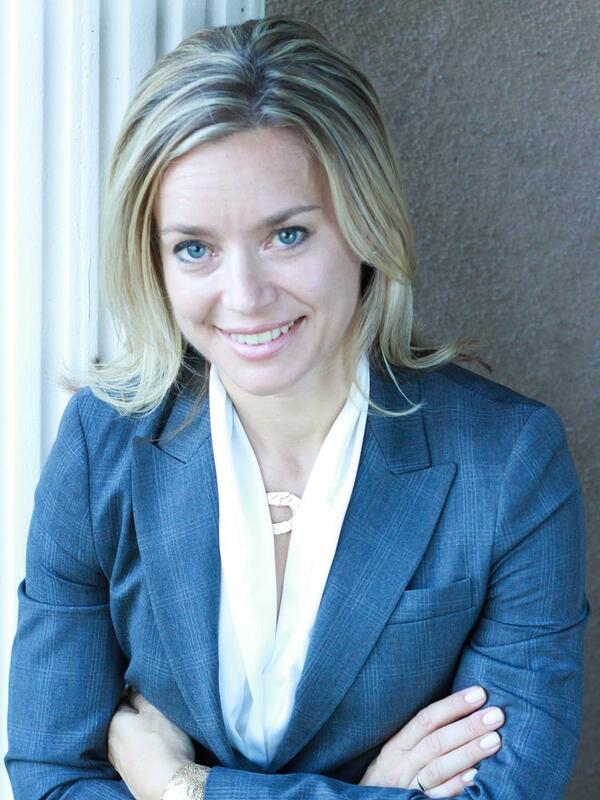 In addition to these highlights, we bring you an interview with Ms. Julie Smith, President and CEO (designate) of Raptor Pharmaceuticals, who tells of her hopes for the company’s ongoing clinical trial with cysteamine bitartrate in HD. Our interview with Ms. Smith was edited by our newest team member, Associate Editor Ryan Korn, whose contributions we will feature in the coming year. Nat Med. 2014 May; 20(5):536-41. doi: 10.1038/nm.3514. Epub 2014 Apr 28. 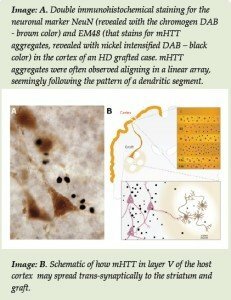 We developed a conditional transgenic mouse model of HD (BACHD) to address the question of how ubiquitously expressed mutant huntingtin (mHTT) may selectively target striatal and cortical neurons for degeneration. The model expresses full-length human mHTT from a genomic transgene that confers endogenous-like mHTT expression patterns. The expression of mHTT in BACHD mice can be genetically shut off in cells that express Cre recombinase, allowing researchers to precisely assess the role of mHTT that is synthesized in one cell type or a combination of cell types in disease pathogenesis. Our study showed that genetically reducing mHTT in cortical neurons significantly ameliorates psychiatric-like behavioral deficits, modestly improves motor impairment, but does not improve neurodegeneration. Importantly, we found that reducing mHTT in both cortical and striatal neurons, but not in either neuronal population alone, consistently improves all the behavioral deficits and selective brain atrophy in this HD mouse model. The study also showed that striatal synaptic dysfunction in BACHD requires both non– cell-autonomous and cell-autonomous toxicities, from cortical and striatal neurons respectively. Together, our study demonstrated distinct but interacting roles of cortical and striatal mHTT in HD pathogenesis, and suggests that optimal HD therapeutics may require targeting mHTT in both cortical and striatal neurons. Nat Genet. 2013 Oct;45(10):1249-54. doi: 10.1038/ng.2732. Epub 2013 Aug 25. Genetic modifiers of HD are a valuable source of potential therapeutic targets for this devastating disorder1. To uncover such modifiers we performed genetic screens in baker’s yeast, and identified 317 genes whose increased expression led to reduced mHTT toxicity2. 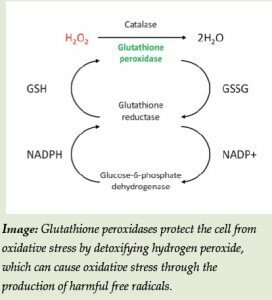 These modifiers are involved in a wide variety of cellular processes and include members of the glutathione peroxidase (GPx) family of antioxidant enzymes, which may help protect against the increase in oxidative stress observed in HD. 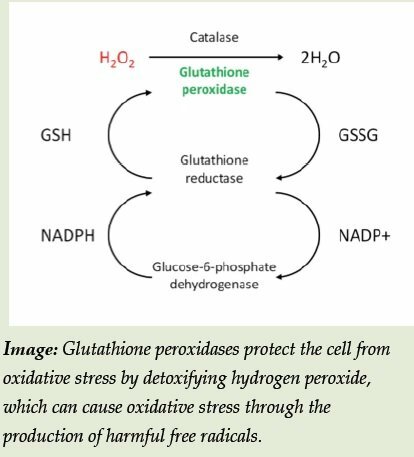 Glutathione peroxidases are an exciting therapeutic target due to the availability of compounds that mimic their activity. These enzymes have been tested in humans for the treatment of stroke and noise-induced hearing loss, 3, 4 possibly expediting translation into the clinic for HD patients. Notably, we found that increased levels of mouse GPX1, the most abundant mammalian glutathione peroxidase, or treatment with the GPx-mimicking compound ebselen, improved disease phenotypes in fruit fly and mammalian cell models of HD. Interestingly, increasing GPx activity was more protective than other antioxidant strategies. Unlike other antioxidant strategies, increasing GPx activity does not inhibit autophagy, an important process for the clearance of mHTT from the cell, which may contribute to the differences in protection observed. Future studies seek to evaluate the efficacy of increasing GPx activity in animal models of HD, providing critical validation before pursuing this novel candidate therapeutic approach in patients. 1 Gusella JF, MacDonald ME, Lee JM. Genetic modifiers of Huntington’s disease. Mov Disord. 2014 Sep 15; 29(11):1359-65. doi: 10.1002/mds.26001. Epub 2014 Aug 25. 2 Mason RP, Casu M, Butler N, Breda C, et al. Glutathione peroxidase activity is neuroprotective in models of Huntington’s disease. Nat Genet. 2013 Oct; 45(10):1249-54. doi: 10.1038/ng.2732. Epub 2013 Aug 25. 3 Day, B.J. 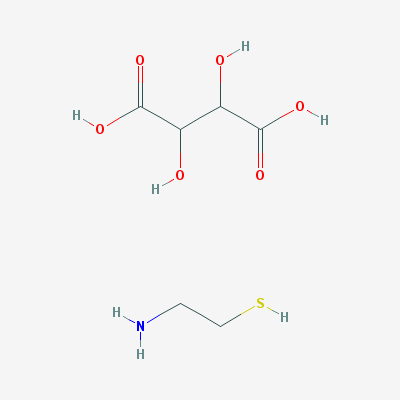 Catalase and glutathione peroxidase mimics. Biochem Pharmacol. 2009 Feb 1; 77(3): 285–296. 4 Lynch ED, Kil J. Compounds for the prevention and treatment of noise-induced hearing loss. Drug Discov Today. 2005 Oct1;10(19):1291-8. Nat Neurosci. 2014 Aug;17(8):1064-72. doi: 10.1038/nn.3761. Epub 2014 Jul 13. This thorough study demonstrates the transneuronal spreading of mHTT that may contribute to non-cell autonomous neuropathology. The authors cultured human neurons from embryonic stem cells and seeded them in organotypic brain slices from the R6/2 mouse model. They subsequently found that mHTT aggregates accumulate in human neurons, leading to pathological consequences for these neurons. These results were recapitulated in vivo in the mouse model. The cortico-striatal pathway was examined using mixed-genotype cortico-striatal brain slice cultures from R6/2 mice and their wild type counterparts. The authors found that mHTT can spread in a pre- to post-synaptic manner, as they found aggregates in wild-type medium spiny neurons after culturing with R6/2 cortex, but not the other way around. Finally, the authors used endoproteases that cleave part of the synaptic vesicle docking fusion SNARE complex, to show that this spread is mediated through synaptic vesicle recycling. The endoproteases used cleave SNAP25 and VAMP. Both treatments significantly reduced the spread of mHTT in their model. Nat Neurosci. 2014 Jun; 17(6):822-31. doi: 10.1038/nn.3721. Epub 2014 May 18. Mitochondrial dysfunction is intimately involved in the progression of HD; however, the mechanism of this dysfunction is unknown. Robert Friedlander’s group explored this in a recent Nature Neuroscience paper. Initially, the authors found that mHTT is specifically localized to mitochondria in brains from HD patients and also mouse models. Unbiased protein identification from immunoprecipitation shows that mHTT binds members of the TIM23 complex, a complex that imports matrix proteins into the inner mitochondrial membrane. Using in vitro mitochondrial protein assays, the group demonstrated that the N-terminus of mHTT is involved in this aberrant binding, leading to decreased mitochondrial protein import. This defect is enhanced in mitochondria purified from synaptosomes, compared to mitochondria purified from other parts of the cell or other cell types. The group showed that the mitochondrial protein import dysfunction is a mHTT specific function and not mediated through the polyglutamine expansion alone, and thus is a mechanism specific to HD. They additionally showed that altering protein import to the mitochondria is neurotoxic and that overexpressing major subunits of the TIM23 complex can rescue mHTT-induced neurotoxicity. APPROVED COMPOUNDS: Cysteamine bitartrate delayed-release capsules (PROCYSBI®), FDA- approved in 2013 for treatment of nephropathic cystinosis in adults and children age 6 and older. 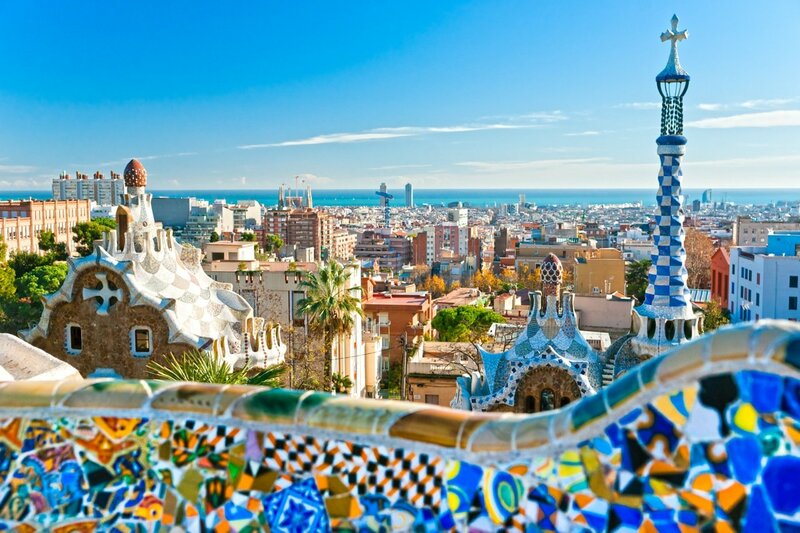 The 8th European HD Network Plenary Meeting was held September 19–21 in Barcelona, Spain, and brought together researchers, clinicians, health professionals, support groups and HD family members, to share the latest in HD research and treatment. Research sessions highlighted recent findings in the biology of HD. Drs. Sarah Tabrizi and Bernhard Landwehrmeyer summarized current knowledge of the natural history of HD. Dr. Tabrizi presented new data on brain connectivity, which is reduced during HD progression, while Dr. Landwehrmeyer emphasized the value of human observational studies such as ENROLL-HD for understanding the natural history of the disease. On the topic of genetic disease modifiers, Dr. Lesley Jones showed that many genetic modifiers of HD appear to be connected to DNA repair and mitochondrial function. Dr. Jong-Min Lee further reported on a recently conducted analysis of genetic modifiers in more than 4,000 people, which identified markers that substantially influence the age of onset of HD. During a session on peripheral tissue pathology, Drs. Maria Björkqvist and Michael Orth showed that major pathologies of adipose and muscle tissues have not been found in HD patients, and that it might be necessary to challenge the systems in order to reveal discrete deficits. Finally, a session on biomarkers included presentations by Dr. Blair Leavitt, who presented robust markers of disease progression and useful analysis techniques such as magnetic resonance spectroscopy, while Dr. Beth Borowsky explained the importance of proper evaluation of biomarkers to improve clinical trials. The treatment of HD was a major focus of the meeting. Dr. Gillian Bates showed that muscle pathologies found in mouse models of HD were completely restored by inhibition of myostatin. Dr. Jan Frich demonstrated positive effects of physiotherapy on motor function and quality of life. The meeting further highlighted a large number of potential therapeutic compounds that are currently under or entering clinical investigation, including KMO inhibitors developed and tested by CHDI, which reduce the production of quinolinic acid and thereby prevent excitotoxicity; pridopidine, a dopamine transmitter stabilizer (Pride-HD study); laquinimod, an immunosuppressive compound (Legato-HD study); PDE10A antagonists, intended to increase striatal cAMP levels (Amarylis and APACHE studies) and Selisistat, a sirtuin 1 inhibitor that modulates the acetylation status of mHTT. Treatment strategies such as deep brain stimulation and gene silencing to lower mHTT levels were also discussed. 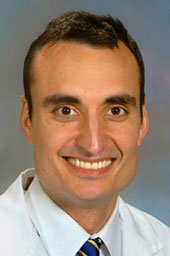 Special emphasis was given to Dr. Tabrizi’s announcement of a safety and tolerability trial of intrathecal anti-sense oligonucleotide delivery, starting in the beginning of 2015. Clinicians as well as HD family members also shared their experiences. Dr. Alexandra Dürr revealed that even though information available on HD has dramatically increased during the past 15 years, only 5–25% of at-risk individuals decide to be tested. A movie night featuring two touching documentary films further illustrated the struggles and perspectives of individuals affected by HD. Jeffrey Carroll and Edward Wild from HD Buzz, who enriched the meeting with daily roundups, amused the audience by raising awareness for HD with the “Pie in the Face Challenge,” first targeting Dr. Landwehrmeyer and then Mr. Carroll himself. The meeting also celebrated the ten-year anniversary of EHDN. Participants honored and bade farewell to Dr. Landwehrmeyer, who stepped down after ten years as EHDN’s chair, and welcomed Dr. Jean-Marc Burgunder as the new chair. Dr. Landwehrmeyer spoke with enthusiasm of the planned and ongoing clinical trials in HD, which he called, “an undeniable success for the HD community.” He indicated that we are getting closer to reaching the goal of establishing disease-modifying treatments. J Clin Invest. 2013 Sep 3; 123(9):4076-88. doi: 10.1172/JCI69411. Epub 2013 Aug 29. The need for sensitive and accurate measurements of preclinical disease progression in at-risk individuals has been a major roadblock in the development of effective treatment for neurodegenerative disorders. 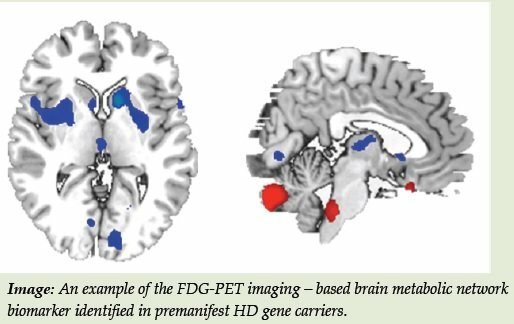 In this fluorodeoxyglucose positron emission tomography (FDG-PET) study, we used a novel computational approach to identify and validate a brain network biomarker of disease progression in premanifest HD carriers. The subjects, who underwent longitudinal metabolic imaging in the rest state, exhibited a significant linear increase in network activity over seven years, continuing even as clinical manifestations emerged. The progression rate of network activity in this cohort was nearly identical to that measured prospectively in an independent cohort of premanifest HD carriers scanned longitudinally over a 2.3 ± 0.3 – year period. Moreover, this rate was found to be faster than the corresponding rates of conventional single-region measurements (i.e. caudate D2 binding and tissue volume) acquired in the same subjects. Thus, the metabolic network can provide a sensitive and reliable means of assessing systems-level changes in the progression of premanifest HD. This network biomarker is currently undergoing further validation in a multicenter longitudinal trial as part of the PREDICT-HD study. The results will help determine its utility in future clinical trials on new treatments targeted at slowing the progression of HD in the premanifest period. Clinical trials to test novel therapies in individuals with premanifest HD have been limited by the scarcity of proven outcome measures and objective measures of disease progression. PREDICT-HD, a thirteen year study, aims to identify markers of HD-related change in individuals with premanifest and early HD needed to determine whether HD treatments are effective early in the disease process. This year’s analysis of the PREDICT-HD data found changes occurring in 36 of 39 potential outcome measures examined over a ten year period in individuals with premanifest HD, which could potentially be used as outcome measures in future therapeutic trials. Specifically, outcome measures of imaging based on regional brain volumes had the largest effect sizes. A motor assessment showed the next highest effect size, followed by a cognitive assessment of working memory, complex scanning and processing speed. Measures of function related to health and disability and measures of psychiatric symptoms such as obsessive-compulsive disorder were also found to show significant change over time. Using these and other outcome measures, clinical trials could be initiated seven to twelve years before motor diagnosis. Neurology. 2013 Sep 24; 81(13):1134-40. doi: 10.1212/WNL.0b013e3182a55ede. Epub 2013 Aug 21. 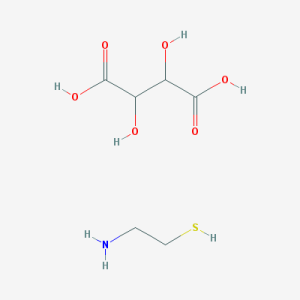 Mutant huntingtin (mHTT) is a target of many treatments currently being developed for HD. Therefore, the ability to measure levels of mHTT in humans will be crucial to future research efforts. Measuring mHTT has been very technically challenging. In our study of white blood cell samples from the PHAROS study, we used a sophisticated fluorescent assay to detect higher relative values of soluble mHTT in gene carriers (CAG≥37) prior to symptoms, and relatively lower values in symptomatic HD subjects. 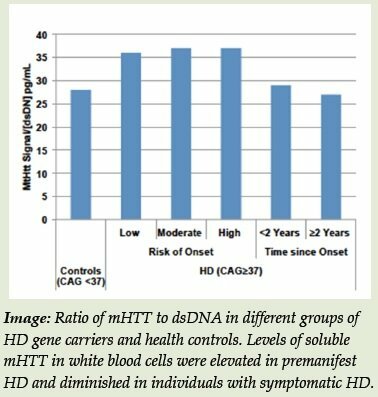 The study demonstrated that soluble mHTT can be usefully detected in blood, and that HD may influence its levels. Since then, we have used this same assay in blood from early HD subjects participating in the HSG’s Reach2HD trial of PBT2 (PRANA Biotechnology), and found that the treatment can affect soluble mHTT levels. Currently, we are developing an assay that can also measure mHTT aggregates in clinical samples, which we believe will also prove useful for developing treatments that target huntingtin. PLoS ONE. 2013 Sep 16; 8(9):e74131. doi: 10.1371/journal.pone.0074131. IMAGE-HD is an Australia-based longitudinal multimodal biomarker development study that followed individuals with HD, and healthy controls, over 30 months. Results from IMAGE-HD have made significant contributions to biomarker discovery and to understanding of the impact of HD neuropathology on brain structure, microstructure, connectivity, and function during both the premanifest and early symptomatic stages. However, much remains to be discovered about the contribution of specific brain regions and/or networks to the phenotypic heterogeneity of HD, and whether these decline at different rates. Such knowledge will be essential for well-targeted disease management strategies and therapeutic interventions. It will be important in the future to investigate the heterogeneity of HD in terms of brain endophenotypes and their relationships with cognitive, psychiatric and motor exophenotypes. Understanding how genetic and/or environmental factors modify these relationships and influence their development will be key to this endeavor. 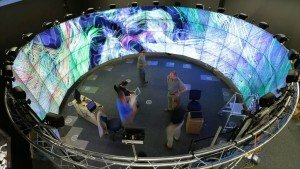 This will require a range of innovative approaches and novel analytical techniques, such as high throughput connectomics and predictive computational models. Image: The Monash CAVE2™, next-generation immersive hybrid 2D and 3D virtual reality environment that enables the interactive exploration of high-throughput imaging data to develop new hypotheses and discover new biomarkers. There is also growing evidence for the potential benefit of cognitive and physical training in forestalling further worsening of HD symptoms. Such non-pharmaceutical interventions offer new and exciting possibilities to explore disease-modifying potential and to determine their neural mechanisms of action. The new CAVE2™ at Monash University will provide state-of-the art capacity for high-throughput neuroimaging data for visualization and sorting of brain images based on pre-defined characteristics, which will enable imaging data to be visualized in new and exciting ways.